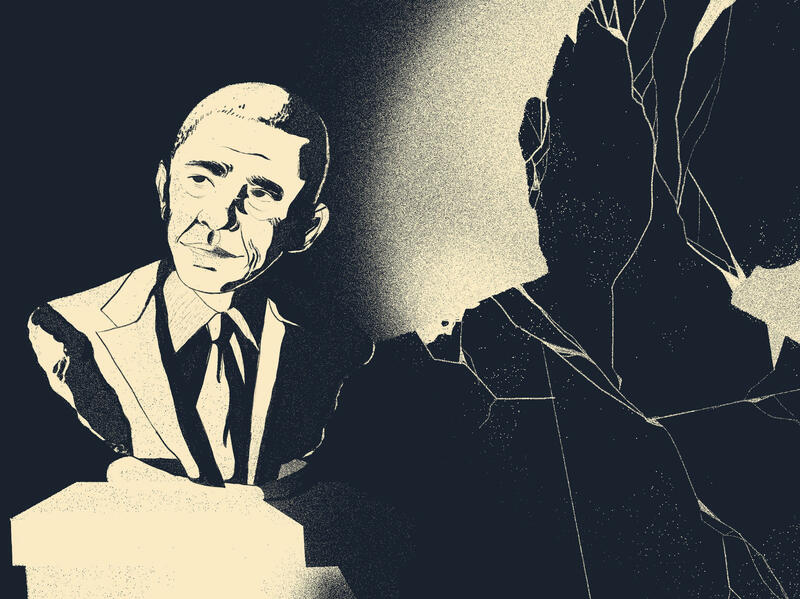 Obama's blackness raised the stakes of his success, exposed the constraints of his office, and made the whiteness at the center of American politics permanently visible. "I'm not the president of Black America," Obama famously said. "I'm the president of the United States of America." In the retelling of the last eight years, we will impose upon him a simplicity that was never even close to true. It wasn't that long ago that the idea of a black man in the White House was a side detail in a movie about the apocalypse, a righteous fantasy in an implausible TV thriller, or the high-concept premise of Dave Chappelle skits. And it was a while into the primaries in 2008 before even black Democrats, who had been loyal to Bill and Hillary Clinton, thought he was viable enough to take seriously. And even when they did, lots of people openly worried that to elect him was to invite his assassination. But there he was on Wednesday, a dude from the South Side of Chicago, sporting one of the sharpest caesars in the history of the planet, trying one last time to calm the nerves of a jittery, divided nation. And President Obama seemed confident that the Oval Office would not be, once again, occupied by an unbroken parade of white dudes. "We're going to have a woman president," Obama said at the presser. "We're going to have a Latino president. And we'll have a Jewish president, a Hindu president. You know, who knows who we're going to have? I suspect we'll have a whole bunch of mixed up presidents at some point that nobody really knows what to call them." Now, Barack Obama enters private life once more, this time as a towering historical figure. Over the last few weeks on the Code Switch podcast, we've tried to game out what has happened to race in America over the last eight years, and what Obama's presidency might mean for race relations in the future. What we heard from our guests was that race shaped both support and dissent for Obama, raised the stakes of his success, exposed the constraints of his office, and made the whiteness at the center of American politics permanently visible. 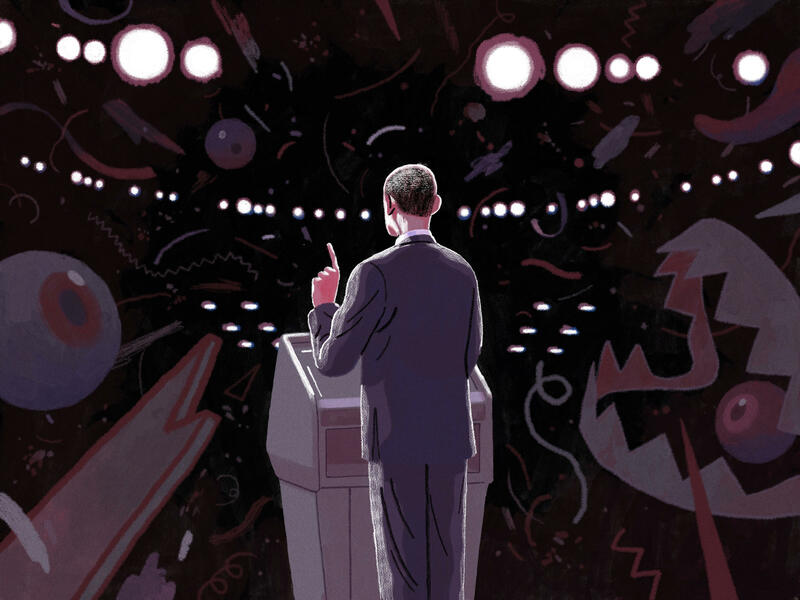 All presidencies matter, but none in modern American life will have similarly animated, reflected or collided with so many of the oft-overlooked cultural and social forces at play in the country. Obama's faith in the inevitability of more American presidents of color was a good example of what Tressie McMillan Cottom might have called Obama's misplaced faith in white folks. Cottom, a sociologist at Virginia Commonwealth University and one our podcast guests, underlined this paradox for us: Obama's optimism about the country's capacity to overcome its racial divisions — a byproduct of his remarkable personal story — made it possible for him to be elected. But, she said, it also led him to underestimate the vehemence of the opposition to his administration, which was punctuated by U.S. Rep. Joe Wilson's (R-S.C.) 2009 outburst at a joint session of Congress. "I still had a little bit of innocence left about how deference for the office of president could protect Barack Obama," she said. "But to think that in the face of all that pageantry that you could still scream 'You lie!' and wag your finger at the president of the United States, that was probably the end of the last shred of innocence I had about how this was going to work. Then I said, 'Oh, this is going to work just like everything else works in this country.' "
What did race have to do with it? What did Wilson's rude disrespect have to do with race? The architects and cheerleaders of the Republican party's policies are, with a few exceptions, white people. The voters they turn out in midterm and presidential elections are, with a few exceptions, white people. Their opposition to the president and to Democrats didn't need to be racist in order to be racialized. Those demographic facts were true long before Obama, but his presidency and the monochromatic opposition party arrayed in lockstep against him certainly seemed to cast those dynamics into sharper relief. There was no way to unsee it. Not that folks didn't try. 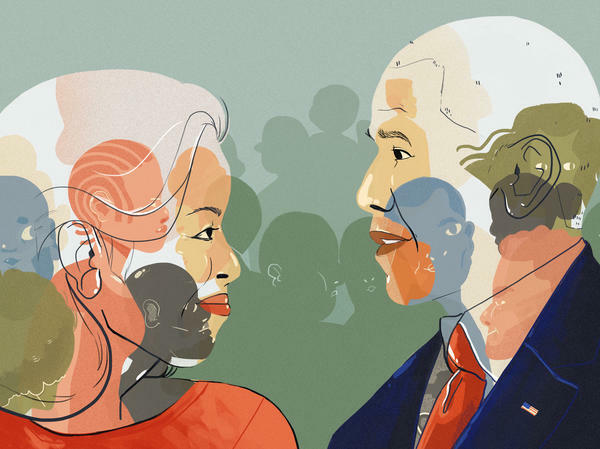 As we pressed these issues in the podcast conversations, I kept thinking about Ray and Arlene, an older, white Montana couple my colleague Shereen Marisol Meraji interviewed in the weeks before the election. They had settled into a comfortable, middle-class retirement, so they weren't competing with anyone for jobs, and there were few immigrants, of either the documented or undocumented variety, in their virtually all-white town. Yet, they said that the dangers presented by immigrants and Muslims, and a nagging fear that the culture was changing in ways they didn't care for, was the most important issue to them. But they weren't racist, they told Shereen. And they said that they never thought about race — that America didn't have any problems with race. That was, until Obama came along and started making everything about race. That last bit, to me, seemed impossible to believe. But Whitney Dow, the creator of The Whiteness Project, told us right before the election that he wasn't surprised at all to hear someone say that. "[When] these guys said, 'Well, I never think about race, but now, every time I look up and see the president, I have to think about race,' it's a reminder about this tension [between] how you see yourself and what you know yourself to be," Dow told us. He'd said he'd felt some of the same disorientation whenever he got a Christmas card with the First Family's picture on it. The family in the White House had always looked like people Ray and Arlene might ostensibly know. Now that they didn't, the whole thing caused folks like them a lot of disquiet, which they had a hard time articulating. That discomfort wasn't always so apparent. Obama was massively popular when he was sworn in in 2009; Americans, even those who didn't vote for him, seemed to be feeling good about the historic presidency — and, for some, good about themselves for feeling good about it. But there came a moment just a few months into his first term when the notion of a black man as president became real. That's when Obama waded into a minor controversy around an ugly encounter between a noted Harvard historian (and, importantly, a black guy) and a local police officer, who was white. "I don't know, not having been there and not seeing all the facts, what role race played in that," Obama said. He went on: "But I think it's fair to say, number one, any of us would be pretty angry; number two, that the Cambridge police acted stupidly in arresting somebody when there was already proof that they were in their own home; and, number three, what I think we know separate and apart from this incident is that there's a long history in this country of African-Americans and Latinos being stopped by law enforcement disproportionately. That's just a fact." It was a question about a dust-up that in an alternate universe a President John McCain probably wouldn't have been asked about. It was an answer that in that alternate universe President McCain certainly wouldn't have given. It was an off-the-cuff moment, but nonetheless surreal — the most powerful official in the country candidly acknowledging that capricious, unnecessary police contact was a fact of life in communities of color. And it was that moment, as Jamelle Bouie of Slate pointed out to us on the podcast, that Obama's approval rating among white Americans took a nosedive. No one knew it at the time, but the Harvard fiasco would be Obama's lowest-stakes foray into issues about race in America, and race and policing in particular. If Americans were scandalized by his remarks about that incident, it's little wonder that his responses to stories like the shooting death of Trayvon Martin would be so polarizing. The "beer summit" that followed was a trifle, one of those weird, facile "conversations" that we too often insist upon following some racial controversy. But it laid bare the tensions between the office of the presidency and the blackness of the man in it, and augured how difficult it would be for him, and for all of us, to easily reconcile those two ideas. Yep, this black presidency was really happening. If Obama's blackness mussed up white folks' notions of the presidency and their relationship to it, his blackness also complicated the ways black folks critiqued the White House. "I'm not the president of Black America," Obama famously said in 2012 when pressed during his re-election campaign on issues of race and inequality. "I'm the president of the United States of America." And even while his approval ratings remained extraordinarily high among black folks, those numbers belied a more complicated story. For one, he was almost certainly being judged against the alternative; the Republican brand is radioactive among black people, and so a dizzying array of black political inclinations is flatly expressed as electoral support for Democrats. That had all sorts of effects on Democratic politics. Even when black lawmakers disagreed with Obama, he was often much more popular than they were in their own districts, and by criticizing him they ran the risk of being seen like they were enabling his opponents. "If Bill Clinton had been in the White House and had failed to address this problem, we probably would be marching on the White House," Emanuel Cleaver, the chair of the Congressional Black Caucus, said about black unemployment in 2011. "There is a less-volatile reaction in the CBC because nobody wants to do anything that would empower the people who hate the president." Here's a thought experiment: Would the rise of the Movement for Black Lives have occurred had Obama never been president? The question gets to the matter of how much the current state of race relations in the country lies at his feet. Some months ago, Khalil Gibran Muhammad, the Harvard historian, pointed me to an idea from political theory called "the revolution of rising expectations." It holds that people don't take to the streets when things are at their worst, but when things are starting to get better — just not fast enough. This idea is often used to explain the outbreak of riots among black folks in the 1960s; the passage of civil rights legislation meant that people could finally envision the prospect of equality and at the same time see that it remained distressingly out of reach. The organizers of the loosely affiliated groups commonly lumped into Black Lives Matter were mostly millennials who were invested in complicating ideas about blackness. They rejected the respectability politics that older folks like President Obama would often invoke. They explicitly interlaced their calls for racial justice with other causes: sexual orientation; gender; class. And yet, he was the first presidential candidate for whom many of these newly activated people had ever voted. Obama's presence, a sign of the gains that black folks had made in American life, had raised their expectations. It's fair to say that many of the most heated racial debates of the Obama era were neither loosed by him nor coincidental to him. "[As] much as symbolic thresholds matter — at lower frequencies where people live — the old race and class problems of structural inequality, normalized stigma, and everyday brutalization, especially at the hands of police, persist," Nikhil Singh, one of our podcast guests, wrote in 2015. "Mass protest against the impunity with which black men and women ... have been killed recently, are bringing the contradictions of the post-civil-rights era to a head. Obama does not deserve credit for this, but he is a symptom." So what will Obama mean to Americans and race going forward? Here are some wild prognostications of my own, since you asked: Outside of the strictures of the White House, Obama will become more pointed about issues of racial justice. He will probably travel a similar trajectory to once-polarizing black figures like Martin Luther King Jr. and Muhammad Ali, both of whom became more beloved, particularly by white Americans, as the details of their battles against justice receded from memory. (Like them, Obama will then be held up as both an example of black excellence — and when useful, invoked as a cudgel.) And in the retelling of the last eight years, we will impose upon him a simplicity that was never even close to true. In the near-term, I can't help thinking about that saying the old folks have: You have to be twice as good and run twice as fast to get half as far. That's either a lament about the drag of racism on black life or a clear-eyed set of instructions on how to deal with it, depending on who's saying it and when. Obama got very, very far, very, very fast — farther than all but a few dozen white men in the history of the republic. Everyone in that cohort arrived with a tremendous amount of self-regard, literal and political capital, and exceedingly good fortune. Shortly after Donald Trump's election, a friend joked that the "twice as good" maxim had been based on extremely conservative arithmetic. There's no way a black candidate with Trump's temperament or backstory, no matter how exponentially better he or she was, could be a credible candidate for national office. Perhaps. It's also probably true that no black candidate without Barack Obama's specific temperament and backstory could have been a credible candidate for the nation's highest office. Looking back with us on the podcast, Jamelle Bouie of Slate wondered if, when it came down to it, the only person who could have been the first black president of the United States was Barack Obama. And still, his patriotism was questioned. His citizenship was questioned. The litigation of his legitimacy — of his Americanness — in the end, may have been the blackest thing about the first black presidency. "Putting Obama's politics aside ... he is an Ivy-League educated constitutional lawyer, who seems to be a moral and upright American example in every way you can imagine," Bouie told Shereen and me. "If Barack Obama isn't good enough for some of these people, then none of us are."